The work experience section of your resume is one of several factors that will determine whether you get the interview – and get the job. A well-written work experience section will show recruiters at-a-glance the jobs you’ve held and what you’ve accomplished over the course of your career. 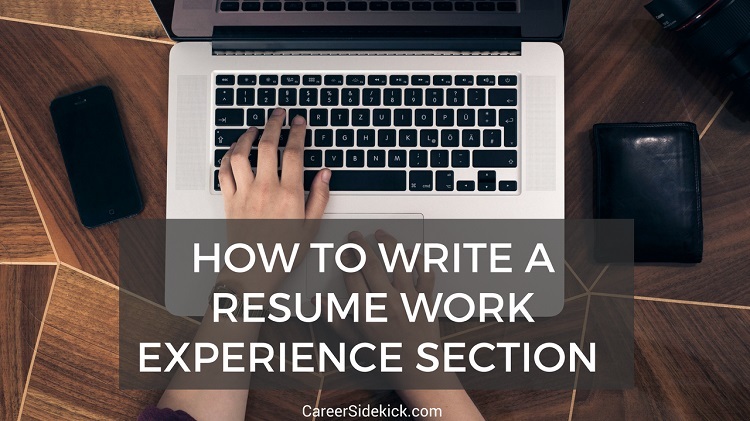 Here are six tips for how to write a resume Work Experience section that will convince recruiters that you are the one for the job! Label the section using conventional headers, such as “Work History,” “Work Experience,” or “Employment Experience.” “In other words, don’t get cute with your resume section headers. Recruiters want the facts laid out in a way that’s easy to digest. This is the preferred format of recruiters, as it makes it very easy to see your past work experience and the progression of your career at a glance. Start with your current or most recent job, noting the company name, location, and dates you worked there. Be sure to keep the formatting uniform; a sloppy resume could knock you out of the running right out of the gate. Experts recommend only listing the past 10 years of employment on your resume. Listing 15 or 20 years of work experience is a key to your age and could invite unintentional bias into the hiring process. You can elaborate on your employment history later when you land that interview. For each position, list your main duties and responsibilities. We recommend using bullet points for clarity and to keep your resume looking clean. Remember, however, that isn’t a novella; 5-8 bullet points should be plenty of space to describe your role. To emphasize or expand on the responsibilities laid out in your resume, use your cover letter. Recruiters don’t just want to see where you’ve worked; they want to see what you’ve been able to achieve. Adding in metrics or other data into your resume work experience section will help demonstrate your value. You might mention a stellar sales record, improved website traffic, or the number of employees you manage. The idea is to show potential employers how your contributions in the workplace have made a real, measurable impact. Even if you work in an industry that primarily requires soft skills ­– and not hard numbers – you can find measurable accomplishments to add. For example, a bartender might add the number of customers served on a monthly basis (it’s ok to estimate); a customer service representative might mention the number of customer calls they handled each month (or, their customer satisfaction numbers). It’s critical that job seekers take the time to personalize each resume they send out. To do this, examine the job ad and pick out the key required skills and responsibilities. These skills and responsibilities then become the keywords you need to focus on throughout your resume, including in your work experience section. So take a look at your resume and make sure that it mentions all of the critical requirements. Add in any skills and experience that you have that might be missing. Next, examine the language of the job ad. Phrase the skills in your resume in the exact same way the job ad does. Echoing the job ad language exactly is vital to getting your resume past an applicant tracking system (ATS), which many companies now use as the first screening gate in the hiring process. Make sure the language you use is identical to the post; ATSs don’t understand nuance. So, for example, if the job ad asks for a candidate with good “oral communication skills” and your resume says that you have good “verbal communication skills,” you may get knocked out of the running even though those phrases mean the same thing. Still not sure how to format your Work History section? A professional resume builder can help. Most have customizable templates that will help you organize your resume properly; many also have pre-written text, spell check, and other tools to make it simple to make a perfect resume. Since 2005, LiveCareer’s team of career coaches, certified resume writers, and savvy technologists have been developing career tools that have helped over 10 million users build stronger resumes, write persuasive cover letters, and develop better interview skills. Land the job you want faster using our free resume examples, templates, writing guides, and easy-to-use resume-builder software.